Vital Elements or Decorative Features? Confession: today’s blog post is brought to you by procrastination. Yes, I should be writing something else. To be fair, I’m doing my best to write something else, but that something isn’t quite cooperating at the moment. This doesn’t often happen to me with short stories. Normally they tumble out in a rushed heap of ideas and plot connections. Then comes the editing. But the one I’m writing at the moment isn’t playing by the rules. It’s a sort of urban fantasy piece. Maybe part of the issue is that it’s been a while since I wrote a story I’d classify as fantasy. My last half-dozen or so stories have been science fiction. And there’s quite a difference in the execution of those two genres. The issue I’m struggling with is the fantasy element and how it contributes to the story as a whole. You can’t just throw in something weird/magical/otherworldly and call it a fantasy story. That aspect has to shape the story itself to the point that the whole thing would fall apart without it. If you can remove the fantasy (or, for that matter, science fictional) aspect from a story, yet still have a perfectly workable tale, then you’re not writing a fantasy (or sci-fi) story. Imagine Star Wars without space travel or the Force. Doesn’t work. Imagine The Lord of the Rings without dark, all-powerful magic. Doesn’t work. Imagine Buffy the Vampire Slayer without vampires or Battlestar Galactica without Cylons. Nope. Those elements aren’t just thrown in for fun. They’re crucial. There is no story without them. But sometimes you have an idea which involves one of the aforementioned weird/magical/otherworldly elements, and along with it, you have the idea for a story. The two may interweave nicely, but not necessarily depend on one another. Or they might not interweave at all. Either way, you have a problem. You might have a story about high school kids, some of whom are vampires, but if, without changing any aspect of the plot, you can replace ‘vampires’ with pale, introverted outcasts, you just have a regular high school story. The speculative elements, be they sci-fi, fantasy, or horror, have to be more than props. They can’t just be superficial details that look shiny and intriguing on the surface but contribute nothing beyond that. That’s what I’m trying to address in my current work-in-progress. The fantasy element is there, and it’s playing a role, but I’m not sure if the role it’s playing is enough. At the moment, I could remove it and still have a story. That’s not good. I’m mulling it over in the hope that I’ll figure out the story’s ending (which is currently sketchy) and in doing so, validate my speculative element. I’m sure I can get it to work. I’m almost 4000 words in and committed to this thing now. I recently stumbled across this interview with the magnificent Hal Duncan. I’ve been a huge fan of his ever since I read The Book of All Hours seven or eight years ago. He’s a literary genius and a wordsmith of the highest calibre. The first book, Vellum, strongly divided people as it’s such a challenging read, but I absolutely loved it. It took me a little while to grasp where he was going with it, but the beautiful writing was enough to sustain me until I had a handle on the story. 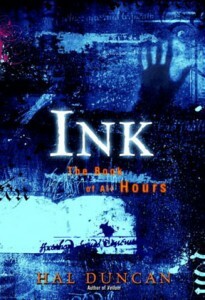 By that time, I was completely hooked and dove straight into the second part, Ink. 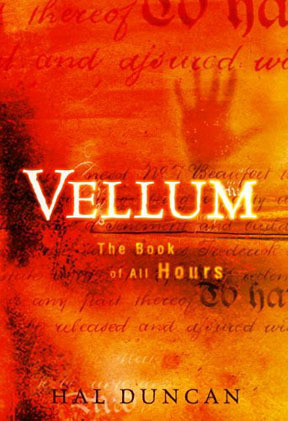 It’s without a doubt one of the most rewarding book sequences I’ve ever read and I was so glad I stuck with the early part of Vellum and got to experience the story in its entirety. So I’m kind of in awe of Mr Duncan. The above interview (featured in Apex Magazine) is a lengthy but fascinating read. I always enjoy hearing other peoples’ creative process, and this is no exception. His answer to the question ‘Why do you write?’ may be one of my favourite things ever. Beware of profanity… but go and read it. There’s even a link to one of his short stories as an added bonus (or if you’d rather read his work than what he has to say about it).